I don’t think I’ve ever made a recipe from Persia. 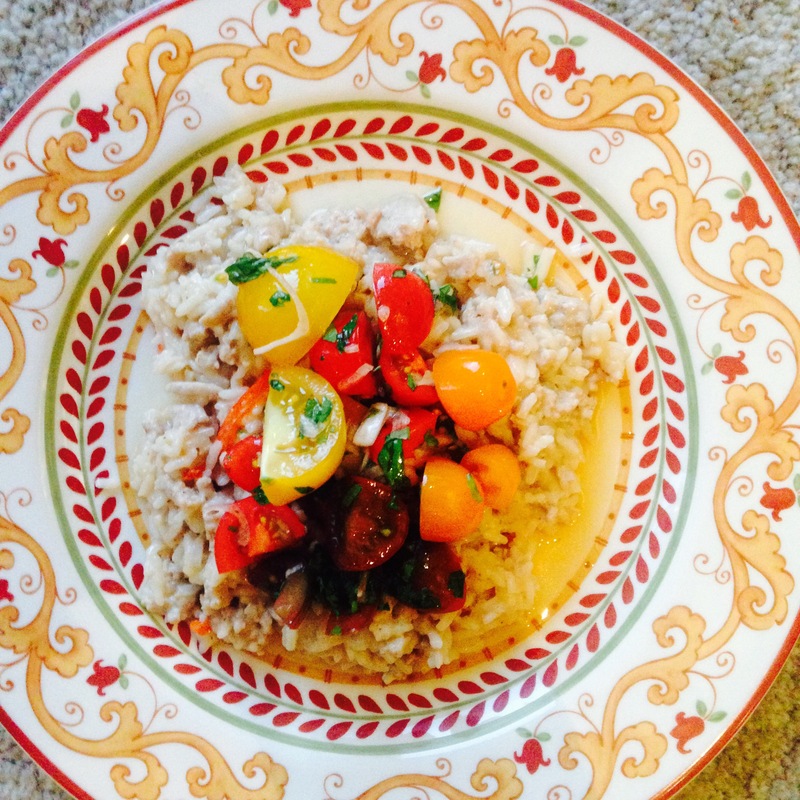 Heck, I’m not even sure I’ve ever eaten Persian food before finding this recipe last week. 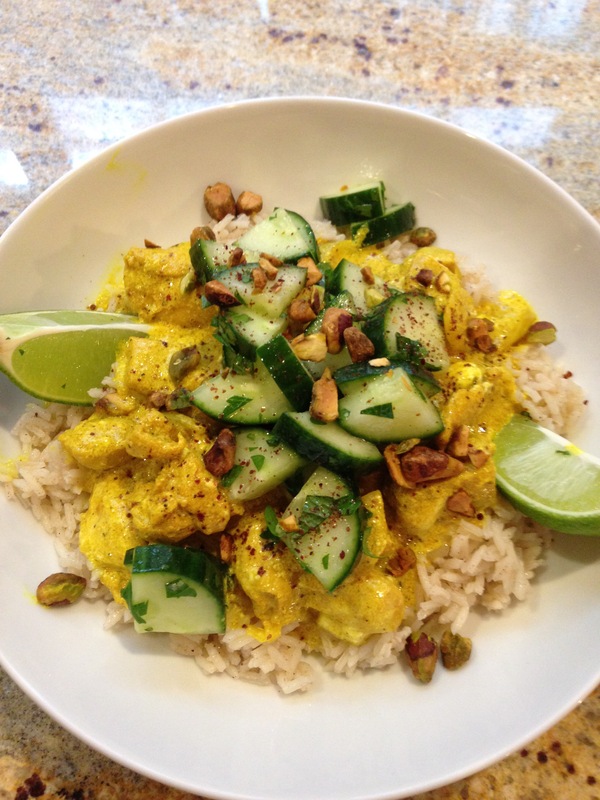 Persian Chicken with Turmeric and Lime caught my eye for several reasons. First of all that color! I mean that is sunshiny-yellow chicken with some seriously verdant green toppings. It’s beautiful, right?? Then looking at the list of ingredients it had lots of the things I’ve grown to love: white rice, warm spices such as cinnamon, cardamom and turmeric, yogurt, and nuts. And not just any nuts but pistachios which easily make the list of my top three all-time favorite nuts. This dish was exotic and familiar at the same time. There’s nothing more cozy to me than a bowl of chicken and rice and that’s exactly what this dish is, but it’s also so much more. The spice mix in the rice alone elevate the lowly basmati rice to something incredible and the hit of the turmeric on the chicken really make this dish unique. Its spicy without being at all hot. This perfect “getaway in a bowl” comes from Epicurious and while the list of ingredients might seem daunting, it is really quite easy and quick to prepare. One word of warning however: if you’re like me and use your hands to rub herbs, marinades and seasonings on meat, you will (as I did) have yellow fingernails for about 3 days after making this! That turmeric is serious stuff! Mix chicken, onion, turmeric, chopped garlic, lime juice, 1 Tbsp. oil, 2 tsp. cumin, 1 tsp. salt, and 3/4 tsp. pepper in a medium bowl. Heat 1 Tbsp. oil over medium in a heavy medium saucepan. Add rice and smashed garlic and cook, stirring frequently, until lightly toasted and fragrant, 1–2 minutes. Stir in cardamom, cinnamon, 1/4 tsp. salt, and remaining 1/4 tsp. cumin and 1/4 tsp. pepper. Add 1 3/4 cups water and bring to a boil, then reduce heat and gently simmer, covered, until water is evaporated and rice is cooked, 18–20 minutes. Remove from heat. Let sit, covered, until ready to serve. Meanwhile, heat remaining 1 Tbsp. oil over medium-high in a large skillet until very hot but not smoking. Add chicken mixture and cook, stirring occasionally, until chicken is cooked through, 6–8 minutes. Remove from heat. Stir in yogurt, if using, then adjust seasoning to taste. Cover to keep warm. Gently toss cucumber, herbs, and remaining 1/4 tsp. salt in a small bowl. I realize that the words “tangy” and “turkey” are probably best not used together. It’s generally not a good thing, but stick with me here and you’ll understand. First off I thought this would be a neat riff on one of my all time favorites, Dan Dan Noodles — only with rice. After all, Dan Dan has the pickled cucumber side and this has a fresh tomato salad on top. Both have ground turkey and well…. OK so apparently that’s the end of the similarities there. They are both excellent and while Dan Dan has always been a go-to dish for me, it now has serious competition! This dish was far better and more complex tasting than its formal name would imply: One Pot Thai Turkey and Rice. Yawn! Then again, it actually got me to try the recipe so that’s saying something. And trust me, you should try this recipe. The turkey and rice mixture is very comforting and rich, thanks to the coconut milk that you cook the rice in. The tomato salad topping is incredibly acidic and zesty and pungent thanks to the fish sauce and the large amount of lime juice. Together, well…. its heaven. Its one of those combinations that just beg you to over-eat. Just one more bite. Well… just a bit more. You get the idea. The recipe comes from Martha Stewart Living. You will definitely want to make this soon, when the tomatoes are at their absolute peak. 1 cup packed fresh cilantro leaves, torn if large Not in my kitchen, just saying! Combine lime juice, 1 to 2 tablespoons fish sauce, and brown sugar in a bowl; stir until sugar is dissolved, then stir in 1/2 cup shallots. Heat oil in a large high-sided skillet over medium-high. Add turkey, ginger, garlic, and remaining 1 3/4 cups shallots. Cook, stirring to break up turkey, until browned, about 9 minutes. Add rice; cook, stirring, 1 minute. Add remaining 1 tablespoon fish sauce, scraping up browned bits from bottom of pan. Add coconut milk, red peppers, 1 1/2 teaspoons salt, and 1 1/4 cups water. Bring to a simmer (do not let boil); cover. Lower heat and gently simmer, stirring occasionally, until rice is tender, about 15 minutes. Toss tomatoes and herbs with dressing in a large bowl; season with salt. Serve over rice, spooning dressing from bottom of bowl over top. Weekly Winner: Goodness Gracious, Great Balls of….Turkey?? Without a doubt, this was the tastiest and prettiest dish I made this week. And it surprised the heck out of me. This dish absolutely has no right whatsoever to be this good. But it is! First of all, the meatballs are turkey….. Turkey! Not pork… not even beef …. but turkey! There’s no super-savory additive, no umami-inducing bacon, soy sauce, or anything really. The magic must lie in the fact that it is all done in one pan. Which besides making sure all the flavor stays in one place, also makes it super easy! The rice takes on a wonderful “pilaffy” aroma and taste. There’s just enough lemon and garlic to make it savory, but not zingy or too acidic. The recipe comes from Cook’s Country and as is the case with most of their recipes, it is flawless. It’s perfectly tested, works beautifully and has a short, manageable list of ingredients. But it tastes so much more complex than the sum of its parts. It should be a decent dish. However, there is no reason why it is as wonderfully tasty and comforting as it is. I’m perplexed … but happily perplexed. Try it and then explain to me what makes it so good! Pulse bread in food processor to fine crumbs, 10 to 15 pulses; transfer to large bowl. Add turkey, 2 tablespoons scallion greens, egg, 2 tablespoons parsley, 1 1/2 teaspoons lemon zest, 1/2 teaspoon salt, and 1/2 teaspoon pepper and mix with your hands until thoroughly combined. Divide mixture into 20 portions (about 1 heaping tablespoon each). Roll into meatballs, transfer to plate, and refrigerate for 15 minutes. Heat oil in 12-inch nonstick skillet over medium-high heat until shimmering. Cook meatballs until well browned all over, 5 to 7 minutes. Transfer meatballs to paper towel–lined plate, leaving fat in skillet. Return skillet to medium-high heat and add rice. Cook, stirring frequently, until edges of rice begin to turn translucent, about 1 minute. Add scallion whites, garlic, and 1/2 teaspoon salt and cook until fragrant, about 1 minute. Add broth, lemon juice, and remaining 1 1/2 teaspoons lemon zest and bring to boil. Return meatballs to skillet, cover, and reduce heat to low. Cook until rice is tender and meatballs are cooked through, about 20 minutes. Remove from heat and let sit, covered, for 5 minutes. Sprinkle with Parmesan, remaining scallion greens, and remaining 1 tablespoon parsley. Serve with lemon wedges. This dish totally befuddles me. The definition of a conundrum is “anything that puzzles” and this does just that. It puzzles me. It’s called simply, Chicken & Rice Casserole. First of all, I find chicken and rice dishes to generally be comfortingly bland…mild….soothing. As a matter of fact, when we got our first cat many years ago and took him to the vet right after adopting him, he suffered from what the vet called “shelter stomach” or what we refer to as an upset tummy. He prescribed that I feed him white rice mixed with chicken baby food for a few days. He loved it and it seemed to do the trick. That’s the thing with chicken and rice…. it’s something you crave when you don’t want anything too flavorful. But I digress… back to the conundrum casserole. I really shouldn’t like this dish as much as I do. First of all, I am basically not a fan of wild rice. Given the choice between various rices, my order of preference is always: white, brown, and then wild… if nothing else is available. Then there is the almonds. I don’t like almonds. But they totally work in this recipe. It just wouldn’t be the same without them. There is just something so incredibly hearty, rich, smoky (thanks to my beloved bacon) and elegant about this dish, that it floors me every time. I never think of a casserole as a dish I would serve to company, but I would serve this without hesitation. I just can’t quite figure out what makes it so dang good. It is a puzzle … which indeed makes it a conundrum. A very tasty conundrum at that. I believe the recipe came from Cuisine at Home magazine, but I’m not entirely sure about that either. See? Everything about this dish confuses me! Preheat oven to 400 degrees. Lightly coat a 2-quart baking dish with nonstick spray. Cook bacon in a large skillet over medium heat until crisp. Transfer bacon to paper-towel-lined plate; drain and discard all but 3 Tbsps drippings from skillet. Add carrot to drippings and cook until beginning to soften, about 4 minutes. 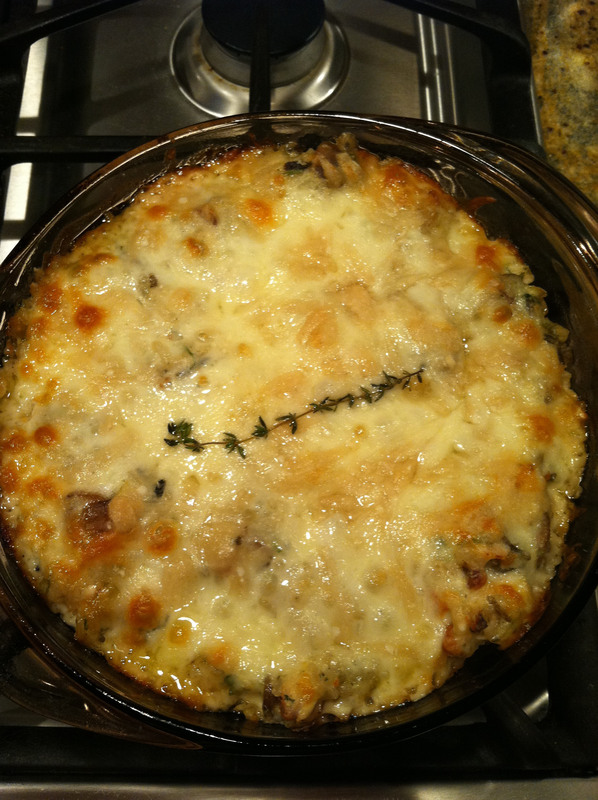 Add mushrooms and celery to skillet, cook until mushrooms soften, then add leeks and garlic. Cook vegetable mixture until tender, about 4 minutes, season with salt and pepper. Transfer mixture to a large bowl. Stir rice, chicken, bacon, sour cream, almonds, parsley, thyme, and lemon juice into vegetable mixture. Transfer mixture to prepared baking dish. Combine Jack and Parmesan cheeses; sprinkle over top of rice mixture. Bake casserole until cheese begins to brown, 25-30 minutes.